The beginning of the school year marks the introduction of bacterial infections and viruses that can keep our kids home and away from valuable learning time. Classrooms can be incubators for strep throat, upper-respiratory infections, and stomach bugs. While the flu can be tamed with an annual vaccination, attempting to keep kids from catching all the other common childhood illnesses is my largest and most difficult task as a mom. 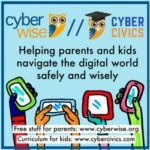 When little sneezes and drippy icky coughs fly through the classroom air, the only defense from catching the next airborne sickness is to ensure that your child’s immune system is up for a good fight against vicious viruses and bullying bacteria. Diet and exercise are crucial factors in building a strong immune system; persuading children to eat healthy and to get up and move means lots of positive motivation, encouragement and making healthy food and exercise fun. 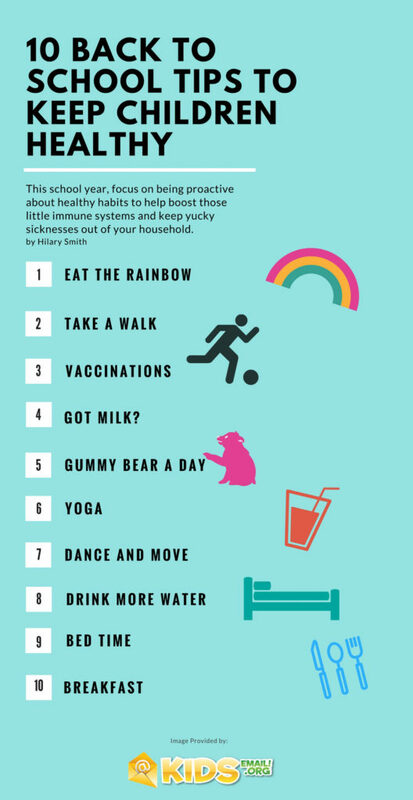 This school year, focus on being proactive about healthy habits to help boost those little immune systems and keep yucky sicknesses out of your household. Fruits and vegetables come in every color of the rainbow. Each fruit and vegetable helps kids gain different vitamins and nutrients to fortify their immune systems. Make eating veggies fun by creating rainbow designs out of different foods. Use red bell peppers, carrots, yellow bell peppers, green celery, black olives (for blue), and eggplant or purple carrots. Serve veggies with a fun dip like Green Goddess dressing, hummus or ranch. Remember that raw veggies are best. Walking is a fun way to encourage kids to get out and move. Exercise helps build strength and endurance. Walk around the neighborhood (aim for 30 minutes), and use the time to talk to kids about their day. Create games during the walk to fight boredom; make a scavenger hunt and encourage kids to find items along the route. Some illnesses can be prevented. An annual flu vaccine will protect against the most common seasonal strains of the flu. Other vaccines—like Measles/Mumps/Rubella (MMR) and DTaP (Diptheria, Tetanus and Pertussis)—protect against more serious viral and bacterial infections. These vaccinations allow the immune system to develop antibodies to ward off these dangerous infections. Talk to your pediatrician if you have any concerns or questions about the risks of vaccinations. Milk provides a great source of calcium, which helps promote strong bones and teeth. Strong bones are important to constantly growing bodies. Children following a vegan lifestyle or who are allergic to dairy can find just as much calcium in a glass of soy milk, almond milk or cashew milk. If you have a picky eater, consult your pediatrician about adding in a daily vitamin to cover any missed nutrients of a limited diet. Today’s most popular vitamins for kids come in a gummy variety. Just make sure you keep the jar away from little hands that might mistake them for candy. Yoga increases flexibility and coordination and helps children implement relaxation techniques. Many local gyms offer yoga classes for kids or you can buy instruction videos and books online. Dancing and even hula hooping move and tone muscles and give kids a fun workout! Have a dance-off with your kids or turn up the music and see who can rock the hula hoop longest. Our bodies need water, which flushes out wastes to keep us healthy. Encourage kids to substitute water for sugary drinks like juice and soda. The proper amount of sleep is a huge factor in enabling the body to fight off illnesses. A good night’s sleep is imperative for a child. Most school-age kids need between 10 to 13 hours of sleep each night. 10. Eat a good breakfast. The most important meal of the day helps children start the day off right and fuel up for a busy school schedule. A hungry, nutrient-deficient child is one that is more prone to illness. Encouraging healthy habits will help your child’s immune system get the boost it needs to ward off the nastiest infections floating around classrooms this fall.